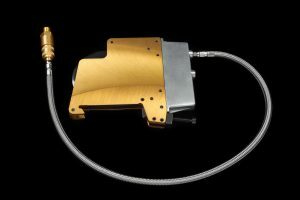 American Quicksilver Company is the only worldwide supplier of our “Gold-Standard” pneumatic score knife holder assemblies. Pneumatic Holders cut lengthwise, with an air-actuated mechanism that presses the knife against the hardened sleeve with the material being slit between them. The AQS Holder is an inexpensive, highly-accurate, and reliable alternative to identical PQAS style holders supplied worldwide. AQS Gold-Standard knife holders have a titanium skin, allowing the knife to “float” between the side plates, operating with less friction which increases holder life. The titanium skin on the side plates is harder than the knife itself, allowing the side plates to resist high heat from friction and adds additional protection against warping. The skin also allows for better lubricity and wear resistance. The titanium coating increases the hardness of the side plates to be harder than the knife, which gives the knife greater wear resistance. Finally, the titanium skin is extremely rust and corrosion resistant, even more resistant than the black-oxide coating on our standard holder. The Titanium Coating helps to prevent rust and corrosion. If you have a “wet” or “contaminated” conditions, this could be your answer! AQS holders are made with hardened, precision-ground side plates and our tolerance on our standard holder width is .499” +.001/-.000”. This holder supports most standard score knives. Contact us today to learn more about our Pneumatic Knife Holders for your processes!